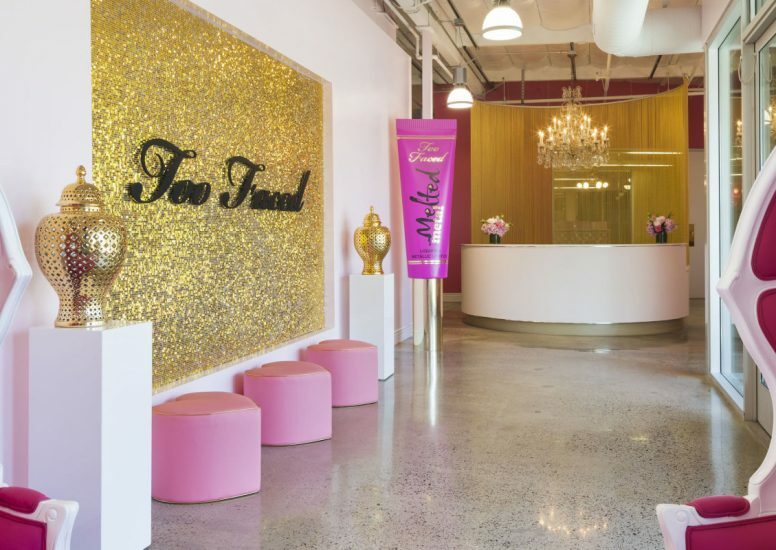 Well established in the US, California based boutique cosmetics brand Too Faced, is much loved in the UK, by those ‘in the know’, who queue online, alongside the brand’s international fans to buy Too Faced’s latest products, as they launch. 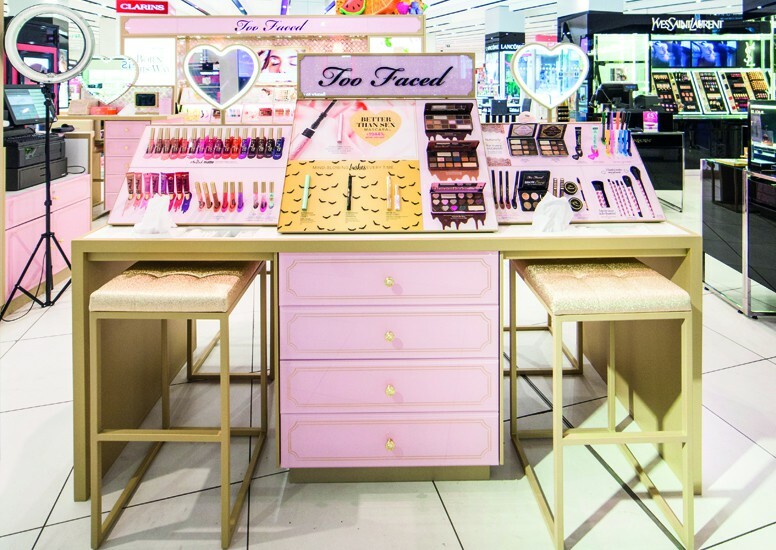 Now, British fans will be able to find Too Faced closer to home, as the brand has chosen the UK to launch their global retail concept, with a concept designed by D4R. When Jerrod Blandino and Jeremy Johnson founded the brand, they were keen to start a company that brought back unapologetic glamour and femininity. 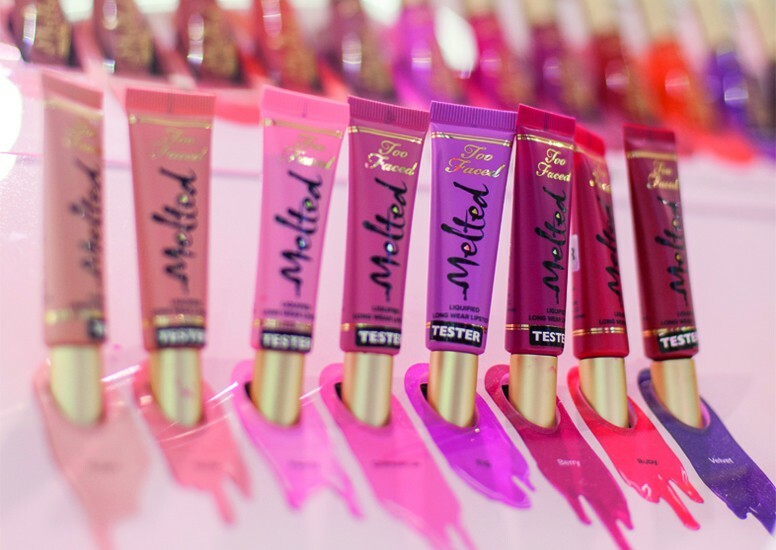 Inspired by a love of Paris, unabashed girliness and the transformative power of cosmetics, they created Too Faced. We were invited to meet them at their flamboyant HQ in California for an initial briefing, and along with an exploration of their products and loyal customers, this visit provided us with inspiration for our design/concept. 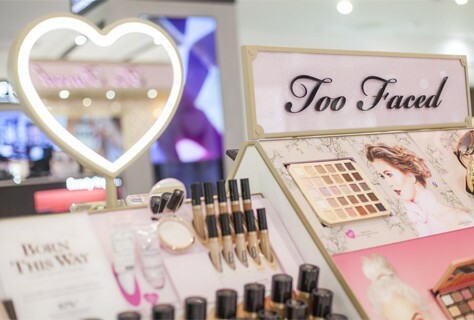 Typically, Too Faced’s customers range in age, from 18 to somewhere in their thirties, beyond that they don’t like to pigeonhole their customer by a particular look. With their #ownyourpretty tagline, it’s more about their character and attitude, the Too Faced customer is irreverent, playful, smart and above all else confident, she owns her own look and her own version of pretty. Our role was to create a concept that would reflect the many facets of her personality, whilst showcasing the Too Faced brand and its products. 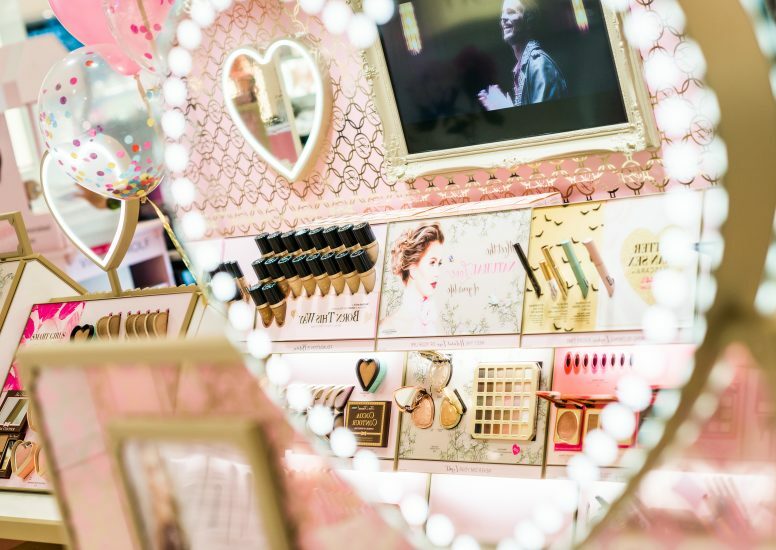 Responding to the brief to create a truly unique Too Faced environment that would welcome both existing and new shoppers, our concept is unashamedly pink, It’s the girly boudoir, with the sumptuous dressing table every girl would love to own. The concept is a juxtaposition of styles and textures, with a bit of, what the..? thrown in. Whilst the products and the packaging provide a cacophony of colour, the palette of the concept is very pink and gold with accents of black, which you’d think would create a calmer backdrop, but not quite! It’s Parisian town house meets the exuberance of rococo, meets contemporary styling, meets California cool. Heart shaped mirrors and frame details are complemented by ornate gold drawer handles and bow adorned wall lights. Look again and you see a stylised French dressing table in rococo pink, embellished with gold coach-line detailing, yet the lines, materials and execution are all very contemporary. Throughout, there are unexpected details that delight and surprise, its playfully decadent, a little bit disruptive, very feminine, so Too Faced. 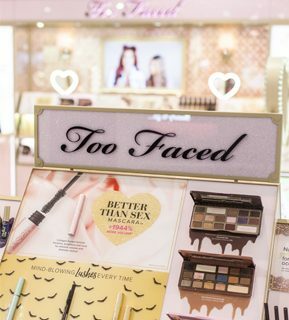 The concessions are a Too Faced playground, presenting their full product range via testers, giving customers the opportunity to try every product available. 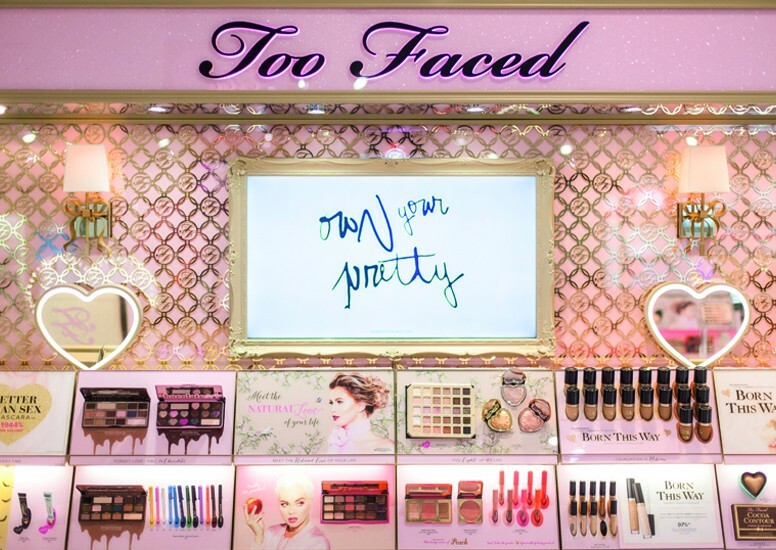 Too Faced’s colourful collections are displayed against a baby pink canvas, framed in gold, with the brand’s latest collections taking centre stage. An attention grabbing, branded glittery pink header announces their arrival, while inspirational photography shows customers some of the looks they can hope to achieve. Alongside, products are displayed by category, making it easy for every customer to shop for their needs; whether they’re looking for a new foundation, lip colour, mascara or eye-colour palette. For existing customers, products are quick to find, making replenishment easy; and for new customers the product presentation introduces them to the collections, with logical layout helping them to navigate across the categories. Central to the concept are the makeup stations, which provide plenty of opportunity for customers to ‘test and play’ and get to know the products. 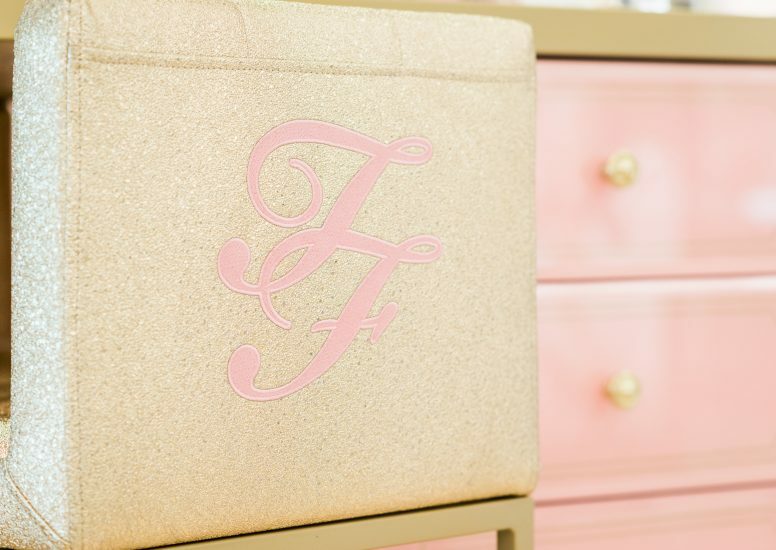 Double sided and with a marbled top, they are also edged in gold and feature backlit heart shaped mirrors and an inset screen giving customers the option to do their own thing, or follow one of Too Faced’s many video tutorials, as they sit comfortably on their bespoke, glittery gold stools, embellished with a TF monogram in the brand’s signature pink. 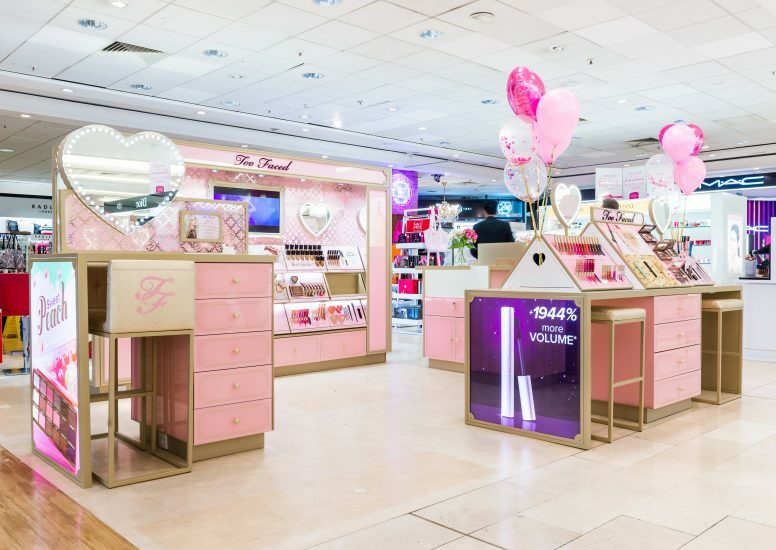 The back wall provides a beacon for the brand; signposted by the same pink header that is used at smaller scale on the merchandising unitary, but with a back-lit Too Faced logo. 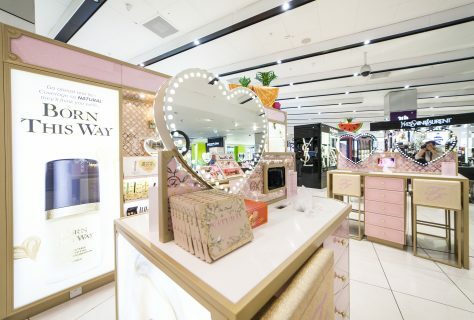 Set against a specially designed pink and gold decorative brand wall paper, the back wall also features a large screen playing video campaigns and makeup tutorials, delivering greater stand out for the brand in the beauty hall. Below the digital screens, the space is versatile, and dependent on the store and its customers, it can be used for different purposes. 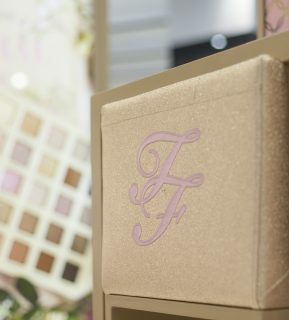 In Selfridges, Too Faced is located in the department store’s ‘Beauty Workshop’; here the back wall provides a relaxed space where the brand’s beauty experts can give customers one-to-one tutorials and educate them about Too Faced’s collections and new products, as well as giving them their desired look chosen from a menu of options; for a night out, for work, or an ‘all-natural you’. 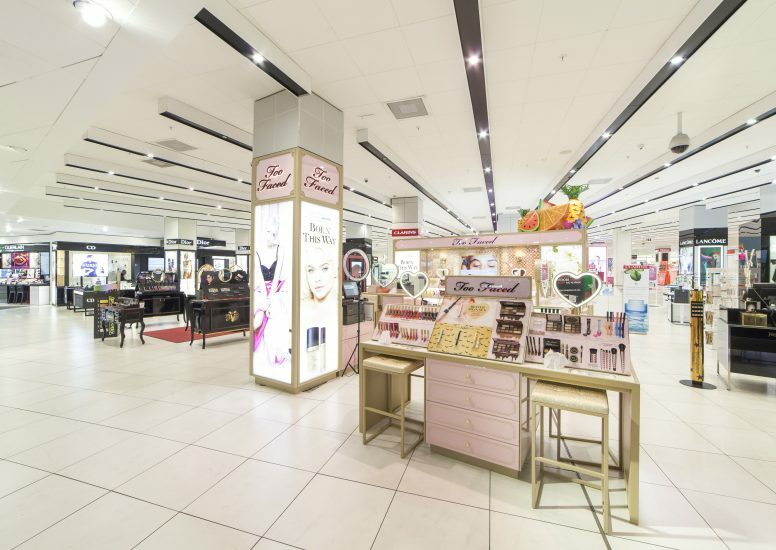 In Debenhams, the back wall allows additional space to merchandise their full cosmetics range and highlight best-selling products, with shoppable product available in drawers behind each tester – so customers can self-serve, or be served by consultants, whichever their preference. On larger sites, large light boxes showcase their latest ‘must have’ products and related campaign imagery, enticing customers to come and try the products out for themselves. Fundamentally the concept is both scalable and flexible, with a kit of parts that form a palette for the brand at retail. It provides a solution which allows each market to implement an iteration of the design based, not only on the cultural and individual customer preferences, but also the service levels required by each retailer and the available footprint. And with a set of guidelines, and a palette of materials readily available in each market, we have ensured that it can be implemented locally, whilst retaining the brand’s equity. The first manifestations of the global retail concept have just launched, and can be found in Selfridges and Debenhams on Oxford Street and Debenhams Leicester, with further sites in Debenhams stores launching over the coming months.